Warwickshire's Chief Fire Officer has condemned the decision to press criminal charges against three firefighters who were cleared of the manslaughter of four colleagues in a warehouse blaze in 2007. 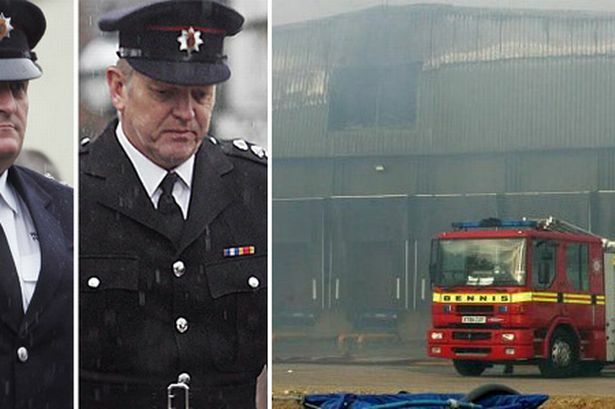 Warwickshire&apos;s Chief Fire Officer has condemned the decision to press criminal charges against three firefighters who were cleared of the manslaughter of four colleagues in a warehouse blaze in 2007. Station Manager Timothy Woodward and Watch Manager Adrian Ashley were cleared by a jury at Stafford Crown Court following the deaths of Ashley Stephens, Darren Yates-Badley, John Averis and Ian Reid in a huge blaze in Atherstone-on-Stour. The prosecution had alleged that Mr Woodward and Mr Ashley, who acted as incident commanders were criminally responsible for the "needless" deaths of the four-man breathing apparatus crew. But CFO Graeme Smith - who claimed Adrian Ashley, Paul Simmons and Timothy Woodward had been "treated like common criminals" - is now calling for the Home Office and Ministry of Justice to investigate how and why the prosecution was allowed to proceed. The fire chief, who was present in court during much of the six-week trial, said: "It is crystal clear that these cases should never have been brought to court in the first place. "But today neither I nor any of my colleagues in the Warwickshire Fire and Rescue Service feel any sense of relief. Rather we feel a sense of sorrow and remembrance for the four brave firefighters who died at Atherstone-on-Stour in 2007." Both Warwickshire Fire and Rescue Service and the Chief Fire Officers Association have serious concerns about the case. Mr Smith and both bodies will be writing to the Home Secretary and to the Justice Secretary to seek a formal investigation into the prosecution. Voicing concern that such prosecutions may make fire commanders more risk averse, possibly impacting on the safety of the public, Mr Smith was also critical of "undue aggression" shown towards the firefighters charged with manslaughter during their time in police custody. During two days in the custody of Warwickshire Police, Mr Simmons, Mr Ashley, and Mr Woodward had their belts and shoelaces taken away and were also held at a police station overnight between interviews. Mr Smith said: "The police investigation into this fire took a wrong turn very early on. "The police treated decent fire officers like common criminals. The court heard they were locked up in the cells overnight and even had their shoelaces taken away from them. "It has taken almost five years and five million pounds of public money to construct a flimsy case against these three men and when it was presented in court it simply fell apart." Police investigations into the death of firefighters had been completed more rapidly elsewhere in the UK, enabling lessons to be learned swiftly, Mr Smith also said. But the Atherstone-on-Stour inquiry was handled poorly and put firefighters&apos; safety behind the needs of the police inquiry, Mr Smith alleged. There were two independent reports into the blaze, one commissioned by the police and another commissioned by the Warwickshire Fire Service, which was seized by the police before Warwickshire Fire Service had a chance to consider it. Mr Smith said: "Both of these reports contained safety critical information of vital importance to the safety of firefighters up and down the country. "Neither of them was released to the fire service until May 2011 - an incredible three-and-a-half years after the fire. "I am outraged that the secrecy surrounding these reports meant that firefighters remained at risk for so long." Addressing the wider issue of whether the fear of prosecution may affect firefighters&apos; decisions as they seek to protect people and property, Mr Smith added: "I am seriously concerned - and the public should be seriously concerned - that today, up and down the country, fire officers will be asking themselves... why on earth would I ever want to be an incident commander and face an unjustified legal attack in the way these three men have?" Warwickshire Police Authority said the main costs of the £4.6 million inquiry into the Atherstone-on-Stour fire were incurred during efforts to recover evidence from the scene of the tragedy. Authority chairman Phil Robson said he and his colleagues always had complete confidence in the investigation and the way it was conducted. Around £3.5 million of the bill generated by the investigation has been met by a special grant from the Home Office, meaning the majority of the cost did not come out of the local policing budget. Mr Robson said: "Investigations cost money, complex investigations cost substantially more money - and this was a very complex investigation. "The main costs were incurred during the early part of the investigation, around securing evidence from a very large scene and an unstable building. "These reduced year by year after the initial work had been done and less staff were required. "I am satisfied that the investigation has been progressed as quickly as professionally possible having regard to all the circumstances." Mr Robson added: "The progress of the investigation has been the subject of several external reviews which ensured our response was proportional to the seriousness of the developing evidence. "The police service has a legal duty to investigate this incident as a crime. There are no more serious criminal investigations than those involving the loss of life."